Jesus Said, 'Let The Little Children Come To Me' So Is 'Children's Church' Really The Best We Can Do When 'A Seven Year Old Child Knows What The Church Is'? It's going to be very tough to "Put The Best Construction" on this today, but I'll try. For the record, let me just state in no uncertain terms that I am not against Sunday School at all. I sincerely believe that Sunday School should be a regular part of a Christian's weekly life (both the children and adults) even though I readily admit that I sometimes do a very poor job of getting my family there each week. However, while I do support the regular use of Sunday School by churches of all denominations, I simply cannot support the concept of so-called "Children's Church" let alone it being conducted at the same time that the Sunday Worship Service is taking place. I also refuse to promote and support its creation and use by a supposedly LCMS church. Why? It's quite simple really. First, anything and everything that seeks to "dumb down" church and God's Word to make it more palatable to the masses (whether those "masses" are kids or adults) is something we should all be firmly against. Second, Jesus said, "let the little children come to me" so is "Children's Church" really the best we can do, especially when the Confessions we proclaim to believe states that "a seven year old child knows that the Church is" too? Lutherans -- have we forgotten who we are!?! Friends, believe it or not, there is a serious spiritual danger at play here that we need to address. It begins by disbelieving the effects of Baptism, and buying into the line that children can not possibly understand the sacrament of the altar until they have adult reasoning skills (Age 13-14). If children are too simple to understand one sacrament, then they are too simple to understand what happens in the service. Sunday School isn’t really the place to teach about the Divine Service, because the children are too young. Therefore, instead of singing the canticles of the church, or teaching great hymnody, children sing about arky arkies, and tell the world of their joy, joy, joy, joy, which resides deep in the depths of their heart. Some people, who aren’t all that fond of children, think, “Gee this noise in church is just too much for me to endure.” They don’t want to say anything – after all, who wants to admit that they don’t like children in church? But soon the child-haters will find an unlikely ally: the child lovers. Children’s sermons are tried, but they don’t work because : 1) Pastor’s hate doing them. 2) Children don’t have the complex reasoning to understand object lessons. 3) Now children are even more puzzled – after all there is a part of church just for them. It must mean the rest isn’t for them at all. More restlessness ensues. Parents start bringing food to appease them. Now, full of sugared cereal, bored out of their minds, and with the message firmly entrenched in their brains that this isn’t for them, they become downright unmanageable. The adults raise their voice to try and fix the problem they themselves have created. 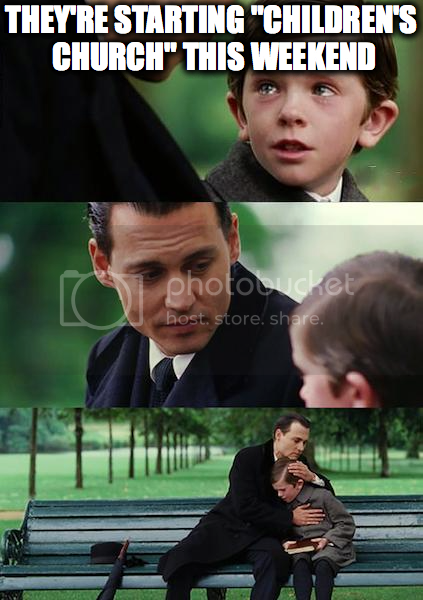 Children don’t like church. We must provide an alternative, therefore let’s start “children’s church”. The child haters are thrilled. After all, the children go away, and they get to look as if they really love the children. The child lovers are so thrilled that the child haters are finally “on their side” that they never stop and think about who really has won the day. Hint : Not the children. Sad really. If the churches were more interesting to look at – that is, if there were artwork and windows and something worth seeing, then maybe the children wouldn’t get bored so easily. If there were something that the children could learn easily – like a standard liturgy – maybe the children would be able to participate in the service. If Sunday school taught them something useful, like hymns, maybe they would be able to sing along. If parents stop giving them sugar the moment they sit down, and sat in the front instead of the back, maybe the children would be able to sit still better and pay attention. Maybe if we truly believed our Lord’s when he said, “Let the little children come unto me” we would try to keep them where our Lord has promised to be – His holy Word and blessed Sacraments. Maybe if we believed our confessions, which say “a seven year old child knows what the church is”, we would consider that if they are smart enough to figure out the church – which our synod has been arguing over for 150 years – they are smart enough to believe our Lord’s Word, “This is my body”. But then, that’s all work and effort. Maybe it’s just easier to ship them to a classroom in the back and have them cut and paste. When they are older, then we will tell them about this church thing, and they can make their decision. I know that had a bit of a bite to it (and no, I'm not against parents feeding their little ones Cheerios in the pews), but it's spot on accurate for the most part from a "Big Picture" perspective. The real-world implications aren't much better I'm afraid. Here's one Lutheran's experience with this "Children's Church" business that mirrors that of so many others too. This is most certainly true. Sad, but 100% true nowadays. Why in the world do we want to EXCLUDE children from the Divine Service!?! Look, let's be honest, because the truth of the matter is that if any congregation feels that they need to create a so-called "Children's Church" for the children in their parish, then isn't that a direct indictment of both the Pastor who is the under-shepherd of that flock of sheep as well as the parents themselves for not fulfilling their vocations in church and at home? Simply put, it's that church's fault if its weekly Sunday School program doesn't already get the job done as it should! Taking children out of the Divine Service where they hear God's Word preached, where they hear, learn, and sing theologically sound hymns, and where they see their parents and grandparents (and other family members and friends) receive the Lord's Supper is a bad, bad thing! Please explain to me how that is supposed to help? Please explain to me how that is a "good" and "noble" practice even if it's being done with only the very best of intentions? Remember, "The road to Hell is paved with the best intentions..." is it not? I submit that this is why we have such apathy, a lack of discernment, and a complete lack of reverence in Christianity today. Furthermore, I believe it only perpetuates the very problem that these well-meaning (but extremely misguided) people think they're fixing with such an endeavor. The whole concept of "Children's Church" -- taking the kids (even up to Middle School age, I've seen) *out* of the gathered Body after a legalistic "Kids Sermon" (isn't always legalistic, but these seem to tend that way) and then listen to the "Adult Sermon! -- this makes my blood boil. I love hearing Pastors that do "Children's Church" at their congregations preach on "unless you are converted and become as a little child..." with the complete absence of little children, because he has sent them *away*. Now that Children’s Church is being added for our young ones, it is only right to dispel any confusion by explaining the difference between the two Sunday morning programs we offer them. The focus of each is actually given us in the titles. SUNDAY SCHOOL is based on a classroom structure with opening exercises that break out to their teachers who follow a set curriculum that leads us through a specific study emphasis according to their age levels. For example, last term we studied Old Testament stories and this period we are studying New Testament stories … what they teach us about our faith and how we apply those lessons to our life. They then have a take-home paper to read and do exercises that will bring the lesson home to them during the week. CHILDREN'S CHURCH is aimed at giving the children age appropriate experience in a church service during the sermon so that 1) they get more out of the time spent listening to the sermon because it will now be on a kid-friendly level and will give them more than a short children’s message would and 2) their parents will be able to get more out of the service as well. Family worship is important so they will not leave the service until after the opening worship and songs. The objective of the children experiencing church in this way is that we can begin to unravel for them things related to church by teachings, fun activities, and answering their questions. We will follow the church calendar and teach lessons appropriate to their learning level. We will use the weekly activity sheet we already get that corresponds to the church calendar lesson of that day, and though it may not be exactly what pastor preaches, it will be on the same theme. We can also do creative projects in preparation for such things as Mother’s Day and prepare for holidays like the Easter Season with a Biblical emphasis. Just as in church, there will be mixed ages but this will teach the concept of fellowship and helping one another. Our aim is to enrich both the children’s and parents’ worship and spiritual lives by offering this program. We want to serve all ages of our congregation, encourage young families to come, as well as to make the Word available across the span of the generations represented within our church family in meaningful ways. Once again, Pragmatism reigns supreme. To put it another way, we already know that doctrine informs practice, and the doctrine of this particular LCMS church (at least it's understanding of Christology, Ecclesiology and Missiology) is that having children sitting in the pews with their parents and grandparents throughout the Divine Service, regardless of their age, is not as "effective" or "successful" as doing it another way. In short, man's way is better than God's way. Proverbs 14:12 (ESV) There is a way that seems right to a man, but its end is the way to death. I suppose it's fitting that this is being launched now and so soon after one of our Chapter Review's on Pastor Fisk's book Broken in which he writes, "...in the postmodern world of Pragmatism, the only thing that matters is whether or not something works..." (page 92). "You can find God anyway you want," he preaches. "You can use your heart, or you can use your hands. Only remember the key to making both heart and hands work is the power of your mind." "Is this the path to Truth, then?" the common man asks. "Friend," he replies, "I'll be honest with you. I'm no theologian. I cannot speak of doctrines. Who am I to put God in a box? But one thing I can tell you: follow me and you will see results." "What of the Scriptures?" the man might ask. "Those are all well and good!" Pragmatism smiles. "There is so much we can learn from them. We only must apply our minds, remembering to test the principles we find to see if our use of them is truly Spirit-led." "How do we do that?" "That is easy. Look at what you are doing based on your interpretation of Scripture, and then ask yourself, does it work?" Isn't this precisely the type of thinking that's fueling this "Children's Church" idea? More importantly, is this a distinctly Lutheran sort of belief and practice or one you'd likely see in a non-Lutheran church instead? My suspicion is the latter. Now, if you think I'm being ridiculous, or that this is "the only effective way" to truly catechize our children and grandchildren in a church like this, then please explain to me what the Lutheran Day School affiliated with this congregation is used for. After all, if it is still a distinctly "Lutheran Day School" like we're so often told despite evidence to the contrary (even despite the removal of the name "Lutheran" to the more non-offensive "Christian" instead so that they can attract children from families of all walks of faith, but with no intention of ever catechizing them to Lutheranism to maintain the "Lutheran" heritage, history, and tradition), then why isn't catechizing being done on a daily basis in the classroom? Again, I'll try to put the best construction on it and assume that it is being done daily, but then we're left with another troubling reality I think, and one that's perhaps more troubling. If our children and grandchildren who are enrolled at this Lutheran Day School are already being catechized in the Lutheran faith in the classroom (and presumably at home as well), then what do they need "Children's Church" for when they attend worship on Sundays? There are really only two possible answers to that question. Either they're not being catechized in the Lutheran faith at school (otherwise, they'd already know why it's important that we all take part in the Divine Liturgy each week -- both young and old! ), or the congregation that's connected to this school is being heavily influenced by all the non-Lutherans enrolled there (or Lutherans-In-Name-Only) rather than the other way around. Bottom line, "Children's Church" sounds like a good idea as it tickles our ears (2 Timothy 4:3-4), but it ironically ends up perpetuating the very problem that everyone's trying to solve in the first place. The answer is not to "dumb down" our beliefs, teachings, and confessions to their lowest common denominator. The answer is to continue to utilize the Small Catechism (or use it more than we have to date!) just like Lutherans have for hundreds of years now. You have got to see this to believe it. Simply amazing. Pastor Michael Mohr, Grace Evangelical Lutheran Church, Strasburg, Illinois (LCMS) has developed a complete program of congregational catechesis. This is a coordinated approach for the whole congregation. In this program, youth are not over in one mind while adults are somewhere else in another mind. Everyone is together, learning and refreshing the same things during the same week. Not only are all the ages united, but the several activities of the congregation and homes merge into one. Worship is not separated from confirmation, confirmation is not separated from family devotion, and family devotion is not separated from congregational worship. There is, if I may say, a sort of a Trinitarian design to this unified program. The portion of the Small Catechism and the Bible texts associated with that portion are used in the Divine Service, in confirmation instruction, and family devotions. that are coordinated with the week’s portion of the Small Catechism and the Bible texts. People are united. Activities are united. The Small Catechism provides the center and unity of this elegant agenda. This is an organism of catechesis that can breath life into a fellowship of confession in which we all come to understand, believe, and confess in common with each other one shared faith. The coordination is well illustrated by one of the sets of materials in the program, the bulletin inserts. The front of the inserts are to be read as part of the worship service or family devotion time, with students (and adults) memorizing given sections according to their level and reviewing (and rememorizing) those sections assigned to lower levels. A devotion is included on the back of the insert for families to use in their devotions during the week. An example of the front and back of the inserts is shown below in this blog post. The materials are designed with levels built in according to age-related ability. Inserts for each week of the academic year (September through May) cover the Six Chief Parts. Inserts for the summer months cover the Table of Duties and the Nicene Creed. Booklets include just the memory work portions and are intended as a resource for students who want to work ahead in completing memory work assignments. A schedule is also included to assist in publishing the correct inserts on the correct Sundays. Because the text of the creeds is different in The Lutheran Hymnal than it is in Lutheran Worship or The Lutheran Service Book, a separate set of inserts is available for congregations using TLH who wish their students to memorize the text that is used in that hymnal. Downloads available include: High Resolution Masters for Bulletin Inserts; School Year Inserts (TLH Version); Summer Inserts (TLH Version); Low Resolution Masters for Bulletin Inserts; School Year Inserts (TLH Version); Summer Inserts (TLH Version); Quiz Resources like “First Try” Quizzes (some words omitted, first letter of word given) (TLH Version); “Second Try” Quizzes (some words omitted, no letters given) (TLH Version); “Third Try” Quizzes (all words omitted, punctuation given) (TLH Version); Quiz Administration and Grading Guidelines; Other Resources like Student Booklets (TLH Version); Schedule for Inserts Table of Bible Verses and Passages. As you can see, this is a turn-key deal. It is all there for you. Simply print and go. That marvelous piece also shows a copy of one such Front/Back Bulletin Insert that you just have to see, because they're so simple and straightforward and are absolutely beautiful -- and definitely better than any "Children's Church" material I can guarantee! There's no good reason whatsoever why a church like this one should want to continue with the "Children's Church" concept as opposed to making the decision to utilize these FREE CONFESSIONAL LUTHERAN RESOURCES instead...unless, of course, pride will prevent them from doing so if not the fact that "Being Lutheran" is not as important as "Being Christian" even when you still identify yourself as a Lutheran church. You might think that's "too harsh" but enough is enough. I'm getting sick and tired of this sort of nonsense in Christ's Church. It's not supposed to be run like a secular business and the Pastor is not supposed to act like a CEO with the parishioners acting like employees or customers. The irony here is that we've arrived at this very place in history (and in this church) all because someone decades ago had similar notions about what *THEY* deemed was "important" and "necessary" in Christ's Church rather than simply allowing the Head of the Church Himself decide and instruct us. As the author of the Lutheran Catechism website has written, "The Catechism is one of the most powerful and recurring engagements of laity by the Church with the truths of Scripture that are able to make one, from childhood, 'wise for salvation through faith which is in Christ Jesus' (2 Timothy 3:15)." 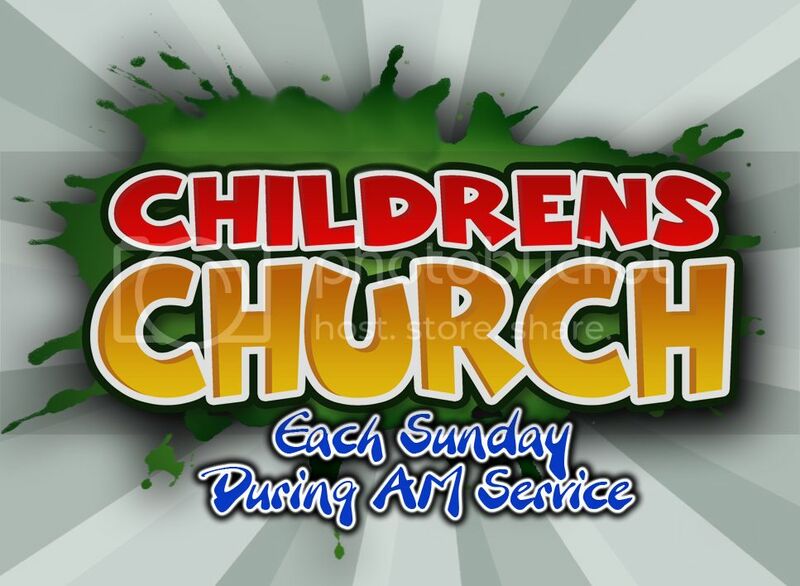 Every time I see "Children's Church" advertised, I picture a paraphrase of Matthew 22:13 happening: "Then the pastor said to the ushers, 'Bind the children hand and foot and cast them into Children's Church. In that place there will be weeping and gnashing of teeth.'" All kidding aside, how does "Children's Church" reconcile with the "let the little children come to me" words spoken by Jesus Himself (Matthew 19:14; Mark 10:14; Luke 18:16)? Excerpt: Yes, children “act up” during the Divine Service or a prayer office. The fussing and commotion easily distract other worshipers within a three-pew radius, at least. Then add the outbursts, the squawks, the munching on Cheerios, the dropped toys clattering on the floor, and the wailing and gnashing of impatient little baby teeth. Yes, it can get distracting for worshipers and pastors. And it certainly becomes exasperating for parents. Mom (and sometimes Dad) is tempted to remove little Johnny or Susie from the service altogether -- walk the walk of shame down the center aisle and camp out in the narthex. To be sure, if Johnny is fussing at the top of his lungs and distracting fellow worshipers, by all means exit the sanctuary until he quiets down. That’s a wonderful service of love for fellow worshipers. But bring Johnny back into the sanctuary! After all, you don’t want him to miss out on all the good “Jesus stuff” happening in the Divine Service, right? Of course, the most glaring issue with those that want "Children's Church" to be a regular part of worship is the spiritual significance they attach to it. It's like "Children's Church" is the mysterious antidote they've all been looking for that will finally help their church grow (or, at the very least, help them to not lose any more members). Again, we fail to forget that it's Christ's Church -- not ours. All the creativity and fun activities in the world won't change that. So, in other words, we need to recognize that the best man-made church program in the history of Christianity cannot grow Christ's Church. Why? Because Christ adds to and grows His own Church as He sees fit, and in His own perfect timing, and He does it through His Word and His Sacraments as the Holy Spirit works through these Means of Grace. Pastor Randy Asburry said it best when he wrote, "JESUS builds and preserves His Church. Not even the absence, or presence, of boisterous children can prevail against it." Thank God, a seven-year-old child knows what the church is, namely, holy believers and sheep who hear the voice of their Shepherd. So children pray, "I believe in one holy Christian church." Its holiness does not consist of surplices, tonsures, albs, or other ceremonies of theirs which they have invented over and above the Holy Scriptures, but it consists of the Word of God and true faith. In a Lutheran layman's terms, there never any good reason at all to ever justify intentionally removing children from the Divine Service...unless it's a full-blown "Contemporary Worship Service" I suppose. "Why My Kids Weren’t At Kids Church"